Julia Donaldson is famous as the author of The Gruffalo, and many more of the UK’s best-loved picture books. But did you know that she’s also a talented songwriter who used to be a busker when she was young? She’s full of surprises! Now this book lets you sing along to over 20 of Julia’s original songs, including fun-filled action rhymes, sing-along Aesop’s fables, and the famous Gruffalo Song! 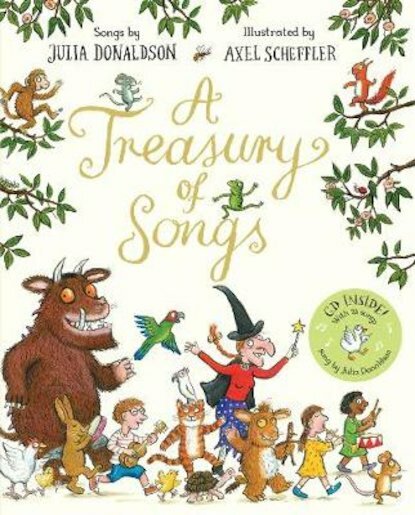 Just to top things off, it’s got Axel Scheffler’s warm and wonderful colour pictures right through, and comes with a CD of all the songs performed by Julia herself. 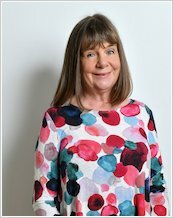 Julia Donaldson is author of many of today’s best-loved picture books including The Gruffalo and Stick Man. Best known for her collaborations with Axel Scheffler, each of these vivid rhyming stories is a triumph of imagination. She was also the Children’s Laureate 2011-2013. More about Julia: “I grew up in a tall Victorian London house with my parents, grandmother, aunt, uncle, younger sister Mary and cat Geoffrey (who was really a prince in disguise. Mary and I would argue about which of us would marry him). Mary and I were always creating imaginary characters and mimicking real ones, and I used to write shows and choreograph ballets for us. I studied Drama and French at Bristol University, where I met Malcolm, a guitar-playing medic to whom I’m now married. Before Malcolm and I had our three sons we used to go busking together and I would write special songs for each country; the best one was in Italian about pasta. The busking led to a career in singing and songwriting, mainly for children’s television. One of my television songs, A Squash and a Squeeze, was made into a book in 1993, with illustrations by the wonderful Axel Scheffler. It was great to hold the book in my hand without it vanishing in the air the way the songs did. This prompted me to unearth some plays I’d written for a school reading group, and since then I’ve had 20 plays published. My real breakthrough was The Gruffalo, again illustrated by Axel. We work separately – he’s in London and I’m in Glasgow – but he sends me letters with lovely funny pictures on the envelopes. My novel The Giants and the Joneses is going to be made into a film by the same team who made the Harry Potter movies, and I have written three books of stories about the anarchic Princess Mirror-Belle who appears from the mirror and disrupts the life of an otherwise ordinary eight-year-old. Axel Scheffler was born in 1957 in Hamburg, Germany. At school, although always good at art, he never really considered a career in illustration. But long before he began his professional life, he had won his first drawing prize for an international chocolate company – his prize was a cuddly lilac cow. Axel went on from school to study History of Art at the University of Hamburg – but he didn’t like the course and decided to leave. Knowing that he wanted to live in another country and learn a second language, he moved to England to study illustration at the Bath Academy of Art. After graduating with a first class degree, Axel moved to London where he began illustrating for a variety of English and German advertising companies, magazines and newspapers. He took his portfolio to a number of publishers and Faber commissioned him to illustrate The Piemakers by Helen Cresswell and The Bottle Rabbit by Bernard McCabe. In 1989, Walker asked Axel to illustrate a text by Jon Blake, You’re a Hero, Daley B. A writer called Julia Donaldson was also writing songs for Playdays at this time and her song A Squash and a Squeeze was commissioned to be a picture book. 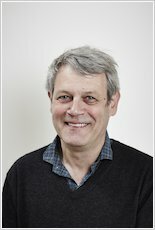 Axel Scheffler was recommended as an illustrator for the text and an award-winning team was created. Their next book, The Gruffalo, was published in March 1999 and has already become a modern classic, selling more than 2 million copies worldwide and translated into over 20 languages. Axel also continues to illustrate for other authors as well, including Ian Whybrow and David Henry Wilson. Axel has achieved worldwide acclaim for his humorous illustrations, and his books have been translated into over 29 languages. He has enjoyed particular success in his award-winning picture book collaborations with Julia Donaldson, but is also the best-selling illustrator of novelty books such as The Bedtime Bear. In 2006 he was been called upon to design Gordon Brown’s annual Christmas card! Still living in London, Axel makes frequent visits to continental Europe. His hobbies include walking, cooking and reading and beadwork.